Thunder and I headed over to the Indy cluster after about 4 months out ofthe ring. Thunder is just over 2 years and I am really not pushing him... I want him to enjoy the show ring as much as his father, Jackson, does! So, we went over to the shows on Sat/Sun of Feb 11-12 and Thunder took Best of Breed today - over some very nice specials (one of which is his half sister Dani - who is EXCEPTIONAL!) 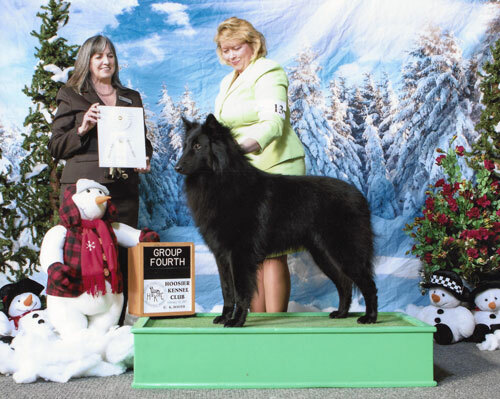 Then, he went into the Herding Group and picked up a VERY NICE Herding Group 4 under Mrs. Deborah Anthony! WHAT A WONDERFUL WIN!!!! So pleased with my young dog! He is growing up so nicely!! !